Channa Dal with Zucchini using Arvinda’s Curry Masala. If you can find Lauki, Indian bottle gourd you can use this instead of zucchini as it’s a very typical pairing. I can’t believe it’s 2019. Happy New Year to you all and hope you’ve eased into January and found a new rhythm to life as we inch ahead another year on our biological clocks! My mantra for 2019 is to be in the moment. It’s all we’ve got and we need to be reminded that our health is our wealth! That’s my favourite cliché because it’s so true. Like them or not, our January resolutions always start with good intentions in the hopes that every year we become healthier, happier and better people with time. Every day is a fresh start and so is a new year, so why not take the opportunity to set some new targets? 1) Have more turmeric: My morning routine consists of detoxifying with a turmeric, ginger, chai-chili elixir that I mix with hot water and drink as a warm (not hot) tea to wake up the digestive system. I pre-make this concentrate and simply store it in the fridge and every morning mix 1/2 cup with 1/2 cup of boiling water. So far so good and fingers crossed, the winter sniffles should keep at bay! 2) Meditate more: I realize how important a meditation practice is and in 2019 I feel it is needed more than ever. This year adding more minutes of meditation to my regimen is a priority to reduce stress, increase awareness and bring forth more calm and happiness. So far these extra few minutes in the morning and night have worked wonders in an amazingly short time. Amazing and powerful! 3) Try more foods and recipes: In 2018 I pushed my culinary boundaries by trying new foods, cuisines and recipes from all over the world. We often get stuck making the same dishes over again, especially if these are the foods ourselves and our loved ones enjoy and it’s so easy to fall back on the tested, tried and true! But change is amazing and invigorating! By tasting new spice combinations and trying new recipes, I came to realize how many great flavours I was missing out on. So this year, I take that a step further and continue enjoying new foods and flavours—and not to forget sitting at the table to savour every new creation made by scratch! That is the shortlist and there’s more to come! There’s definitely something to be said about goal setting. When we set our sights onto something, it becomes our path and a ‘way’ to follow that takes us closer to what we feel will bring us happiness. One of the most famous pieces of research on goal setting is the Harvard MBA study from 1979 that found the 3% of graduates who wrote down their goals achieved them versus the 97% who did not! Exciting! This year more than ever, we’re thinking about and concerned by the environment, excess waste, global climatic change and our ecological footprint. This is a great time to experiment with different plant-based proteins like pulses and beans. With Canada being the world’s largest producers of lentils, this is also an excellent local choice as well that supports our local farmers. Low in fat, low on the glycemic index, low in sugar, high in protein, iron, fibre and vital minerals it’s a win all across the board. Not to mention, when paired with delicious and healthy Indian spices like turmeric, then this starts ticking off many New Year’s resolutions on the list! One of our favourite dal recipes is Channa Dal with Zucchini and many people who have attended Arvinda’s cooking classes over the years will know this one very well! So we started the new year off right by having this dish…ticking off the many goals on our list! :) Enjoy! 1) Wash soaked channa dal in 4-5 changes of lukewarm water or until water runs clear. In a medium pot, simmer channa dal and zucchini in water with salt on medium-high heat. Add enough water to cover dal and zucchini. Partially cover and cook until dal is thoroughly cooked, approximately 10-15 minutes. 2) In a separate pan, heat oil on medium-high heat. Add mustard seeds and fry until they pop. Take care spices do not burn. Add tomato and mix in ARVINDA’S CURRY MASALA. Stir in sugar and fry for 2-3 minutes to make a masala paste. 3) Add cooked channa dal and zucchini including liquid to masala paste. Mix and simmer for a few minutes until dal has thickened. Add salt to taste, if necessary and thin out with extra water if required. 4) Garnish with cilantro and a sprinkle of ARVINDA’S GARAM MASALA. Serves well with rice and Indian chapatis. Wishing you a wonderful 2019 and hope everyone receives many good things all year long! One of the most coveted Indian foods is the Samosa, triangle shaped deep-fried pastries with a spiced potato filling. Generally speaking, people all over the world love hand-held foods that are savoury, satiating, tasty and easy-to-eat. At times, these little pastries can function as a mini-meal if paired with a side salad. In the case of the Samosa, since it’s a deep-fried indulgence we see it mostly served as an appetizer or snack, popular during the festive times of year, like Diwali, India’s Festival of Lights. Every autumn, we celebrate the festival Diwali, India’s jubilant Festival of Lights practiced by Hindus, Sikhs and Jains all over the world. As part of the tradition, people illuminate their homes with clay lamps called diyas to bring light into everyone’s lives during these darker days. Metaphorically speaking, this light symbolizes the victory of good over evil. As we celebrate Diwali today, a very auspicious day, this is the time of year our family makes and serves Samosas at home. Several weeks back our customers Kate, from the East Coast requested a Samosa recipe using Arvinda’s Curry Masala, and others have also requested it for awhile now too. For those who have joined Arvinda’s Indian cooking classes over the years, you’ll recognize this recipe as we’ve shared this one many times over. Everyone (including the kids) have made this easy recipe with fantastic results over and over again. There are many ways to make the pastry as there are different styles of Samosas (depending of the region of India), however you can choose to make this filling and pair it with any pastry of your choice really (using a pre-made pastry from the frozen section of the grocery store, or a homemade one of your choice). Posting this has got me thinking we must offer our Samosa making workshop once again soon. Should anyone be interested in learning to make traditional Samosas from different regions of India, please do send us a message! In the meantime, here’s Arvinda’s Basic Potato & Peas Samosa Filling. 1) In a medium pot, heat oil on medium high heat and add whole cumin seeds. Fry until slightly browned. 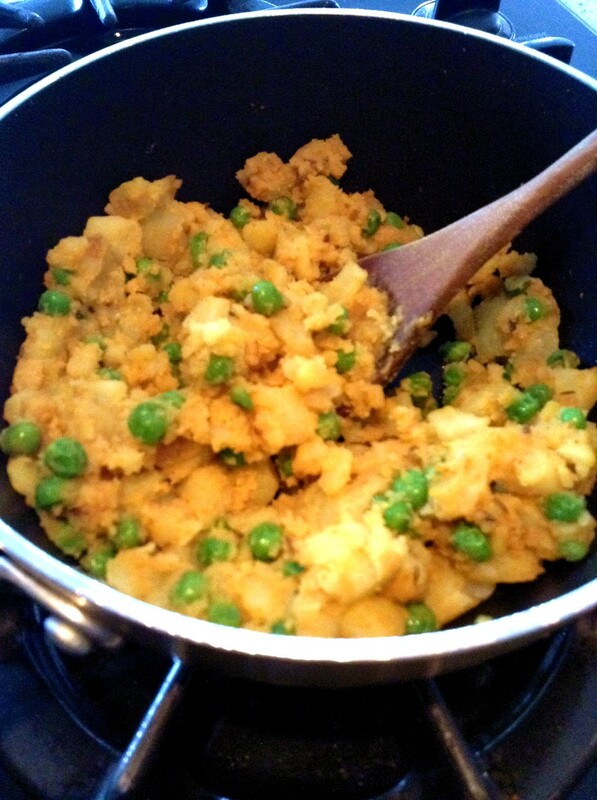 Add peas, ARVINDA’S CURRY MASALA (OR BOMBAY SHAKE GARLIC) and salt to taste. Stir for a minute or two. 2) Fold in cubed potatoes, cover and cook for 10-15 minutes or until potatoes are soft and cooked. 3) Garnish with ARVINDA’S GARAM MASALA and mix. Set aside to cool then fill into pastry of your choice! Wishing you lights and love on this Diwali Day! I love making pasta from scratch. It's the soft texture and unique homemade fillings that make it worthwhile to make it from scratch. I had some leftover Curried Sweet Potato Mash and stuffed it into homemade ravioli topped with a Curry Leaf Indian Spiced Pasta Sauce. Indian-Italian fusion! 1) On medium heat, gently heat olive oil. Add garlic and onion and fry until fragrant, for a couple of minutes. Add ARVINDA'S CURRY LEAVES and fry for one minute. 2) Add diced tomatoes (with liquid reserve). Simmer for a couple of minutes. Stir in ARVINDA'S CURRY MASALA and sea salt to taste. Gently spoon in pasta and toss for a couple of minutes. Serve hot and enjoy. An easy and simple appetizer for any holiday table, guests will be happy with this for not only its protein but also for its flavour. Arvinda's Curry Masala delicately spices up the filling and Arvinda's Garam Masala finishes it off with a touch of warmth. I like these to look rustic, so I just used a teaspoon to spoon into each egg half. 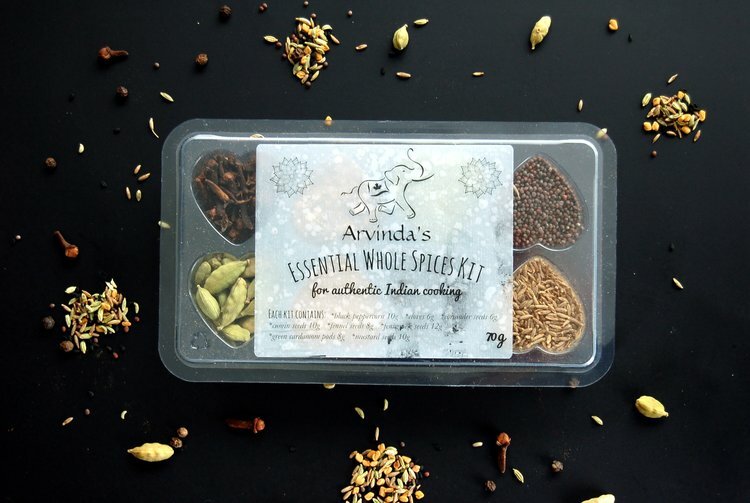 Arrange on a platter and garnish with a sprinkle of Arvinda’s Garam Masala, red pepper, red onion and a cilantro leaf. 1) In a bowl, finely mash hard-boiled egg yolks. Combine with mayonnaise and mix well. Add cilantro, red onion, ARVINDA'S CURRY MASALA, mustard, ARVINDA'S GARAM MASALA. Season with sea salt, to taste. Garnish with red pepper, red onion and cilantro leaves. Yield = 24 pieces. Switch up your next Channa Masala curry with a garnish of dried coconut and sliced bananas on top for a sweet tropical bite! It's surprisingly pleasing with the sweetness of the banana and warming curry flavours. 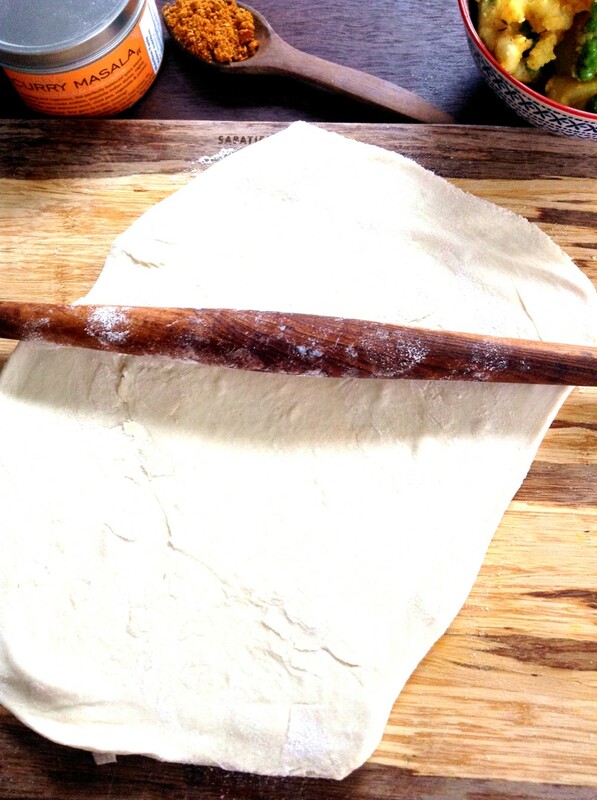 Hint: This could be a good way to get your kids to try Channa Masala. 1) In a medium pot, gently heat olive oil and sauté garlic for a couple of minutes. Add onions and sauté until golden brown. Add grape tomatoes, slightly cook and stir in crushed tomatoes. Mix in apple cider vinegar, ARVINDA'S CURRY MASALA, salt, sugar, turmeric and pepper. Simmer for a couple of minutes. Thin out with water if becomes too thick. Fold in kidney beans, mix and set aside. 2) In a large skillet heat olive oil, add sliced vegetables and sprinkle in salt and pepper. Cover with lid and gently stir every few minutes. Cook until vegetables are tender. This will depend on how thinly the vegetables are sliced, but should take about 15 minutes. 3) Preheat oven to 350F. Line a casserole dish (I used a rectangle oven proof dish) with parchment. Set aside. 4) In a saucepan, heat milk and whisk in flour, ARVINDA'S CURRY MASALA, ARVINDA'S GARAM MASALA, salt and pepper to taste. Whisk until smooth. 5) In the casserole dish layer on half the vegetables. Layer on half the tomato mixture and 1/2 cup grated cheese. Add the remaining vegetables, remaining tomato mixture, Béchamel Sauce and 1/2 cup grated cheese. 5) Bake in preheated oven for 20-25 minutes. Remove from oven and garnish with cilantro. I make this 10-minute Channa Masala when I need dinner on the table in a hurry. Believe me, this is the EASIEST CURRY you can make! All ingredients are basic and should be in your pantry. I hope this recipe can find its way into your repertoire of healthy and quick dinners! I don't typically use beans from a can, so if you prefer using dried beans my suggestion is to boil a huge batch and freeze some for future use. I find the texture is a bit different, but it saves time when you’re in a pinch. Try using the leftovers stuffed into a pita pocket for a quick lunch. 1) Rinse chickpeas and drain. Set aside. In a medium-sized pan, heat oil on medium-high heat. Add ARVINDA'S WHOLE SPICES. Fry for one minute taking care not to burn. 2) Add ground tomatoes and cook for one minute. Stir in ARVINDA'S MADRAS MASALA to make a paste and fry for a couple of minutes. Stir in cooked chickpeas and add water to make a thick sauce. Add sugar and salt to taste. Cover and simmer for 5 minutes. 3) Serve in a serving dish and garnish with ARVINDA'S GARAM MASALA and cilantro. Serve with basmati rice or flatbread and salad to make a healthy, well-balanced meal. A fantastic winter comfort food, Mac n' Cheese with a dash of masala is surprisingly tasty. When we were kids, my mother would make this all the time making a spicy pasta-curry hybrid, with loads of veggies. Here's my version. 1) In a pot of boiling salted water, cook pasta until al dente. Drain and set aside. 2) Preheat oven to broiler setting. 3) In a large pot, heat olive oil on medium heat. Add onion and caramelize until golden brown. Add crushed tomatoes and ARVINDA'S CURRY MASALA. Mix. Add broccoli and cook for 5 minutes. Fold in pasta and mix well. 4) Put in a casserole dish, sprinkle with cheese bake under the broiler for five minutes. Garnish with garlic chives.